The mechanicvs truly is the coolest thing GW has put out in a long time - and that's saying something considering their relentless release-pace these last two years. I'm in hogs heaven just mixing the new kits with stuff in my bits box and see what comes out. To the left is a sinister splice-seer genetor based on a haemonculii concersion I never really liked. To the right the beginnings of an Iron Hand Ironfather - the Iron Hands feel like natural allies to the mechanicvm so I wanted to include at least one in the warband. Awesome stuff, Jeff! I thought I recognised that wraith conversion. The Ironfather looks great! 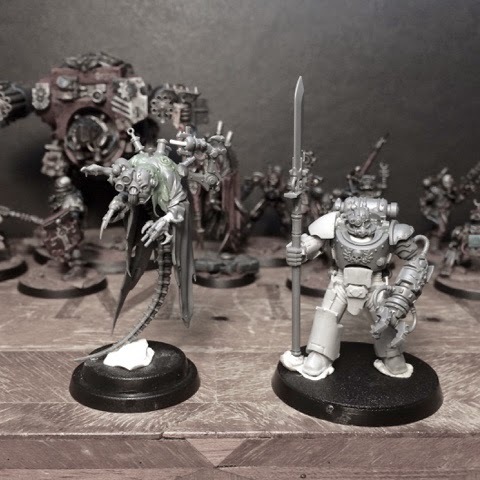 My second mechanicus cairn wraith conversion... Let´s see if i can top adept Prokofiev! Both looking fantastic, the arm on the Iron father is really cool. More mechadendrites one the wraith would really finish it IMHO, the head and arms are sweet. Those arms are the bees knees - they´re from the kataphron servitors. I will add some wires and stuff but I think I´ll keep it to a minimum to make him as different as possible to Prokofiev. They're really, really great kits, huh? They are pretty god-darn amazing mate! Topping Prokofiev is a tall order! Looking great, man. Great models, and I have to agree on the AdMech stuff being the best kits GW has released in quite a while now. It actually brought me back into the hobby from a timeout. They´ve certainly reinvigorated me - glad to hear they have the same effect on others! They look really well done, very characterful. Curious to see them once painted! Fantastic looking models! The splice-seer genetor is wonderful, the head in particular is incredibly fitting. The Iron Father is also top-notch! I love how his bionic arm is so substantial and powerful looking. Any thoughts of giving him some servo arms on his backpack? I think they would be right at home. I'd like to know what parts you used to make the splice-seer. Excellent conversions!! !